This week I am sharing some wonderful stand-alone early and first chapter books with girl protagonists. 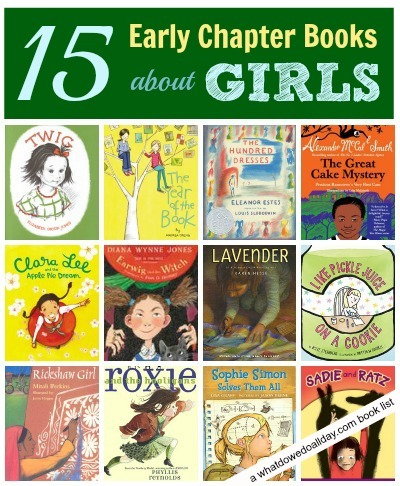 Last week I shared my favorite early chapter book series about girls. However, as you read down the list, you will see that as I was making this list I discovered many of these books will no longer be stand-alones! Nevertheless, I forged ahead …. Now, please remember I have not read every book in the library (although I think the librarians are going to dedicate an entire hold shelf to me soon) so of course if you have titles to add, please leave a comment! You lovely readers always have great suggestions and I even added one to last week’s list! Bramble and Maggie. I’m embarrassed to say that the very first book will no longer be a stand-alone book as of April! That’s good news, however, because after reading the story of how Maggie and Bramble came to be friends, your child will want to read more of their adventures together. This book includes full color illustrations which (generally) indicates an easier reading level. Many children stillchoosing books from the easy reader section will be able to read this book. Sadie and Ratz.This is a droll little book about Hannah who has has named her hands Sadie and Ratz. Sadie and Ratz get blamed for a lot of things and Hannah must come to terms with having a little brother. Like Bramble and Maggie, this book is perfect for beginners. Twig. This one was on my Classic Children’s Books of the 1940s. Twig transforms her corner of the world into an imaginary, fairytale place where a little Elf shrinks her down to size. Roxie and the Hooligans. The bullies at school tease Roxie mercilessly, but when they are all trapped on a desert island with some cut-throat criminals, Roxie draws upon the survival skills knowledge she learned from Lord Thistlebottom’s Book of Pitfalls and How to Survive Them. A very clever book with well-rounded characters (i.e. the bullies turn out not to be stereotypes), a bit of comedy and a lot of adventure. Rickshaw Girl. In Bangladesh, Naimi feels frustrated that as a girl she is constantly told she cannot work to earn money for her family. When she accidentally ruins her father’s rickshaw she disguises herself as a boy and meets someone who will change her life. The book includes a glossary and an author’s note about micro-finance. This is one of my favorites on the list and has earned a number of honors. The Great Cake Mystery. Precious Ramotswe of the No. 1 Ladies’ Detective Agency book series for grown-ups solved her very first case in Botswana when she was just a girl. When her friends’ lunchtime treats go missing Precious is on the job and when she discovers the thief a nice chuckle is had by all. This book is nice way of exposing young readers to other cultures and includes a reading guide, glossary, activity ideas and a recipe! Muggie Maggie. Beverly Cleary’s ability to create lovable characters is evident by her legions of fans. If your child is just about ready for Ramona, introduce them to Maggie, a 3rd grader who does not want to learn cursive! Sophie Simon Solves Them All. I adore this “humorously brusque” heroine who is a genius in spite of her parents who aren’t quite sure why she would want to learn about calculus at the tender age of eight. Sophie, on the other hand, is still learning all about what it means to have friends. A wonderful book. Clara Lee and the Apple Pie Dream. After Clara Lee’s grandfather tells her that her bad dream means she will have good luck, this charming Korean-American girl looks at the rest of her day and her participation in the Little Miss Apple Pie contest in a positive light. The Hundred Dresses. Eleanor Estes’ 1945 book deals with bullying, poverty and courage. A classic, moving story that should be on everyone’s shelves. The Dream Stealer. When a strange, bird-like creature starts stealing her good dreams, Susana insists he get them back. This imaginative story is set in Mexico and Peter Sís’s illustrations are wonderful. Earwig and the Witch. I found Diana Wynne Jones’ final book fairly odd, but then so is the main character (you might expect the same from a girl named “Earwig”). Earwig is adopted by a very bizarre, but very magical couple. Earwig hopes to learn magic, but is treated as a servant instead. However, the clever Earwig and a talking cat are soon able to outwit their guardians. This is for kids who love pure fantasy with odd-ball humor. Cinderella Smith. Cinderella received her nickname due to her propensity for losing one of her shoes. This becomes a problem when she loses a dance shoe before the big recital. She needs to find her shoe as well as help her friend Erin determine whether or not her new stepsister will be “wicked.” Lucky for the reader, she does it all with flair. Plus, the Kindle version is only $3! Disclosure: Don’t forget! This post contains affiliate links. We LOVED Pickle Juice on a Cookie, which I’ve given as gifts numerous times. My daughter also liked Muggie Maggie (anything Beverly Cleary is a hit) and The Great Cake Mystery was one of the few mysteries she pronounced non-scary and was willing to read. I found The Year of the Book just okay and The Hundred Dresses, which I read to fill in gaps in books I should have read as a kid but never did, kind of preachy. Did you know Pickle Juice was to become a series? I’m really excited — also because I love that it takes place in brownstone Brooklyn. Also, One Upon a Heroine, a listing with mini-review of 450 books “girls with love” is an amazing resource. I usually find those types of books useless but I’m really finding a lot I’m interested in in this one. I heard of that book, but I haven’t taken a look at it. Thanks for the recommendation. These sound fantastic thank you for sharing. I hope you find some to enjoy with your kids. So many great books here. I especially enjoyed Earwig and the Witch–talk about a spunky character! Sadly, due to the death of Diana Wynn Jones this one is destined to remain a stand alone. When I was reading it, I thought Earwig would be a good character for her own series. I suspect Jones would have returned to that character again and again had she been able. The subtitle is “girls WILL love.” “With” was a typo. Yes, I just saw the other day that she’s coming out with Bug Juice on a Burger. But I hope it doesn’t turn into one of these factory series where the author churns out a zillion of these books according to a formula. Like Katie Kazoo. Which my kid loves but I don’t. Great list. I have to start picking books at random and giving them to daughter 🙂 Thanks for this great series! I loved your comment about the library dedicating an entire hold shelf for you. I max out my hold list pretty much every week (sometimes more than once in a week), and I often wonder if the librarians are getting tired of pulling so many books for me. Our library has a 10 book hold limit, but fortunately we have 3 library cards! We love The Hundred Dresses so much! It’s a classic for a good reason! Ha! The NYPL has a 15-hold limit but we have 4 library cards in the family. My husband finally had to ask me to stop using up all his hold slots. We moved recently and I walk 15 blocks to our old branch because a certain very helpful guy there is always willing to look for all my oversized books, etc. on all 4 cards that they keep behind the desk. So glad to be back here after a long break! What a fantastic list. I too loved Pickle Juice on a Cookie and am so glad to hear that there is another one coming! We just finished reading Violet Mackarel’s Brilliant Plot which would fit in this category- not fantastic but quite good. Stacey, you’re in good company. So many others mentioned Violet Mackarel that I added her to the last week’s list which was series about girls. Thanks for coming back! What a wonderful list! Thank you for putting it together. I’m glad it’s useful for you. Yay! Thanks for the nice shout-out. The Great Cake Mystery is….well, great! Also started reading the Nina series (http://www.randomhouse.co.uk/editions/nina-and-the-kung-fu-adventure/9781848530911) to my daughter this year, which she liked. It’s a chapter book series, but a bit too much for her to read by herself, but also great! BTW I found your blog via Facebook, glad you have a page there. Are there any on this list that you would particularly recommend for a read aloud choice? My girl is 4 and just getting into hearing chapter books at bedtime and I’m looking for a little inspiration. I would love some great girl stories to offer her. Thanks for the great lists! Hi Sarah, I have a lot of read aloud chapter book recommendations. Please take a look at the index of all my book lists: https://www.whatdowedoallday.com/books-for-kids You can scroll down to the “Read Aloud” section and find what you need there. I have several lists that will be perfect for a 4 year old. Happy Reading.